Día celebrated in the U.S. Senate! Rep. Honda (D-CA) reads with area children. Once again, thanks to the ongoing support of the W.K. 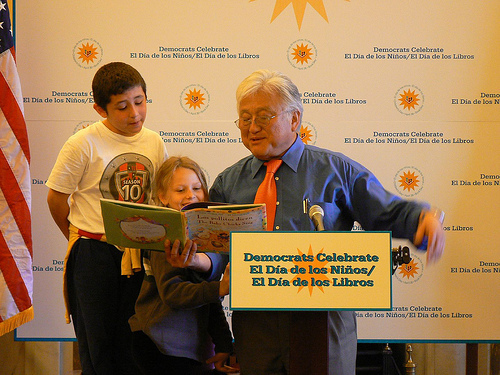 Kellogg Foundation, more than 300 libraries in 38 states celebrated El día de los niños/El día de los libros in 2008. The libraries that registered their Día events with ALSC received a total of about 68,000 complimentary bilingual brochures. The brochures featured Dora the Explorer™ and her friend, Boots. ALA Graphics also offered a Dora poster and bookmark for sale. Libraries shared wonderful plans for their Día events. Most plans included children and their families, books and music. Día, held annually on April 30, celebrates books, language and culture, and allows libraries the opportunity to demonstrate their value within the community as vibrant, cultural, and family-friendly institutions. Access information about 2008 events by using the drop-down options below our interactive map showing this year's events.